On the Information Superhighway Jane Smith Patterson is the cement truck paving the way. While many of us assume that Internet and access to communication is a given, Jane knows there are tens of thousands without access to high speed internet and that matters. “Communications is the main currency to get to other people and get out of where you live and to move around the world,” she shared with me. Over the course of her career in public and private service, Jane Smith Patterson has paid that currency forward again and again and that’s what makes her this month’s Women to Watch. She began working to code computers in her 20’s – having worked in at least 30 countries to bring technology to them since then. Now she works here in her home state of North Carolina to ensure even the most rural communities and schools have access. Among her many projects is digiLEARN, a digial learning institute dedicated to increase availability for students and teachers to innovative technology. The goal of the nonprofit – founded by former Tar Heel State Governor Bev Perdue – is to prepare people to succeed in a technology-driven world. 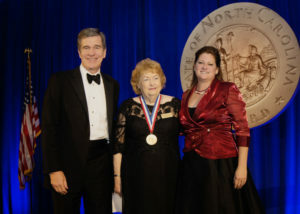 As a result of efforts by people like Perdue and Patterson, by 2009 all 115 public school districts in the state were connected to the North Carolina Research and Education Network (NCREN). In the same year, the North Carolina Virtual Public School (NCVPS) was created and now has at least 60,000 enrollees. “This state is the only state in the country where every school system is connected to a Gigabit network, so anyone can access the classroom,” she shared. Opportunities abound in everything Jane touches. I’d be remiss not to mention her role at the Z. Smith Reynolds Foundation, where for the last 25 years she’s Chaired the Sabbatical Committee, which selects nonprofit leaders for much needed and deserved sabbaticals. While increasing access to technology for the education system is clearly a passion, Patterson also thinks of the needs of women as she pursues those passions. In our conversation, she talked of women of earlier generations who found themselves at home because of family obligations – unable to access an income or education source. I can attest to the power of communication, as a woman who left an office job when I was pregnant with my second daughter because working out of the home for 10 hours a day seemed impossible – though I know many must do it. That transition into working from home would have been impossible had I not had access to high speed internet. Nine years later I make a comfortable salary while having the flexibility to care for my children when they need me. Another fascinating part of our conversation centered around activism and communication. She spoke of the civil rights and women’s rights movements of earlier generations. “It was your feet that walked you to make civil rights happen, it wasn’t connectivity,” she said. Fast forward to the Women’s March, #TimesUp and #MeToo movements, and Patterson says the power of connectivity is evident. “Newspapers didn’t print about the harassment of women (back then). We’re now picking up where we left off. It was your feet that walked you to make civil rights happen – it wasn’t connectivity,” she reminisced. Then she brought it all full circle in our conversation. That made bells ring in my head. To be the change we have to use our feet and our fingers – and thanks to people like Jane – we have the power of both. “Where is the John Lewis growing up in North Carolina that doesn’t have access to the internet? Where’s the poet? Minister? Banker? Where are all those people who would have made it if they’d have had a communication network?”, she asked. Jane grew up in Columbus County – a rural community – and says education was part of the contant mantra of household conversation. She now shares that with her two granddaughters, one of whom wants to be an aeronautical engineer.